Last year I thought I might be getting into a rut with my yearly wine-tasting day trips to the Sierra Foothills right after Thanksgiving. So this year I decided to do something about that. I made it into a two-day trip. The past couple of years I only managed to find two friends to come along with me, so I was surprised at this year’s turnout – at times there were nine of us in four cars trying to stay together along the two-lane roads that wind through the scenic Foothills. This year’s group included Alan, Eric, Jane, Warren, Dean, Tom & Nancy and their young daughter Janine. Because we were stretching this trip into two days, we had time to explore a little more of the Sierra Foothills wine country than usual. In addition to El Dorado and Amador counties, we ventured farther south into Calaveras County this time. How are the three growing regions different from one another? 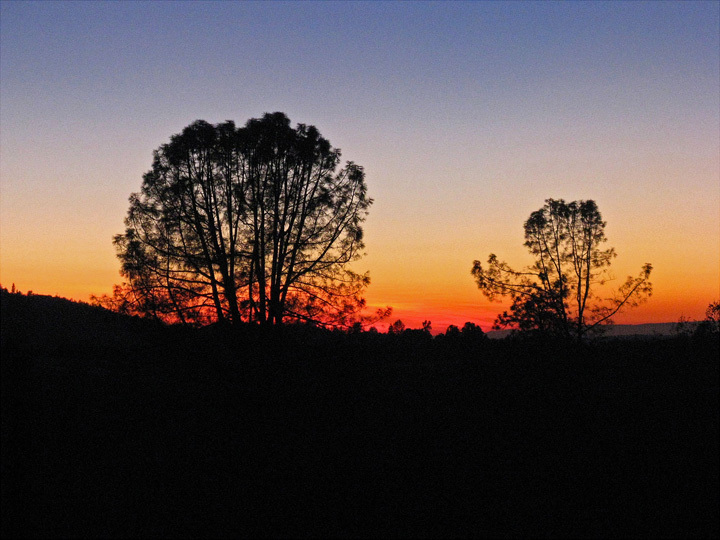 El Dorado is farthest north and tends to be the highest-elevation area of the three, with vineyards located throughout a number of areas north and south of Placerville at elevations of 2,200 to 2,900 feet, with some lower-elevation sites in the Coloma area to the north. 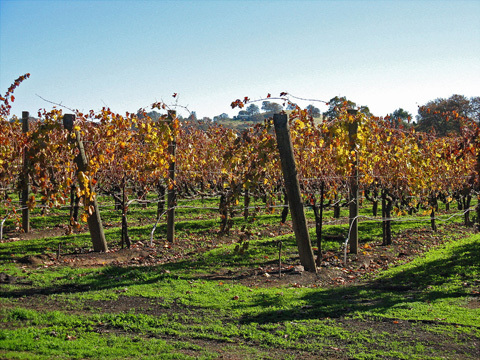 Decomposed granite soil is common to the area, much more so than throughout other winegrape-growing areas in California. Amador is just south of El Dorado and most vineyards there are lower in elevation – mostly from 1,200 to 1,600 feet with a few areas up to 2,000 – so it tends to be hotter. Much of the vineyard land is centered in the Shenandoah Valley and Fiddletown areas. There is some decomposed granite there but also lots of volcanic soil. The Calaveras wine area is about an hour south of the main Amador vineyards. Vineyard elevations are between those of El Dorado and Amador, ranging mostly from 1,700 to 2,000 feet, much of this near the Vallecito and Murphys areas along with some lower sites located farther west toward Angels Camp and Copperopolis. There are varied soils throughout the Calaveras growing regions – as there are throughout the Foothills – with rocky shale in some areas, volcanic soils in others, and heavier clay elsewhere. Most of us started out Friday morning for the 2+ hour drive from the Bay Area, aiming to meet at our first winery stop around 11:15am, with Tom, Nancy, and Janine meeting us later in the day. In contrast to the thick fog we had to drive through last year and the steady rain of the year before, this year’s trip featured unbeatable fall weather throughout – bright sun with temperatures in the mid- to upper 60s. 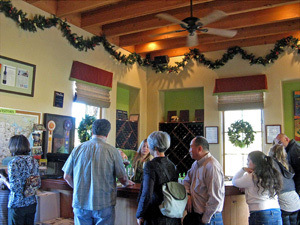 A couple of people stopped at Sierra Vista Winery first – always an enjoyable visit – but no wine notes were taken there. Though our group that morning came separately in three cars, everyone managed to make it to our first official visit at nearby Holly’s Hill Vineyards within a fairly short time of one another. Over the years, Holly’s Hill has been one of my favorite wineries in the Sierra Foothills but for various reasons I had not visited there since 2009, so it was good to return on this trip. 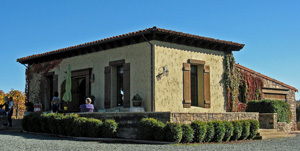 Holly’s Hill, located south of Placerville in the Pleasant Valley area, is one of the Sierra Foothills’ Rhône-style wine specialists. Winery owners Tom & Holly Cooper fell in love with Rhône wines after sharing a bottle of Châteauneuf-du-Pape on their honeymoon. Tom & Holly’s daughter Carrie is the winemaker, while Carrie’s husband Josh Bendick shares in the winemaking duties as well as sales and marketing. Both Carrie and Josh had worked at other El Dorado County wineries before settling into the family business at Holly’s Hill. Holly’s Hill 2010 “Patriarche Blanc,” El Dorado. 57% Roussanne, 29% Grenache Blanc, 14% Viognier. Light yellow color, featuring apple and pear aromas with light floral and lees notes. Medium weight in the mouth with nice acidity on the finish. Holly’s Hill 2010 “Patriarche,” El Dorado. 47% Mourvèdre, 37% Syrah, 11% Grenache, 5% Counoise. Medium color, showing plum and darker fruits, earth, dried herbs and lots of spice. Medium-bodied with moderate tannins and a lingering finish, nice. Holly’s Hill 2010 Grenache Noir, El Dorado. Medium-light red-purple color, this displayed fresh strawberry and herbs on the nose. Medium-light and lively on the palate, finishing with medium tannins. Holly’s Hill 2010 “Petite Patriarche,” El Dorado. 83% Mourvèdre, 14% Grenache, 3% Syrah. Medium-light color, with plum and black cherry fruit, earth, and a brushy note. Brighter mouthfeel than the regular “Patriarche” bottling, with a grippier finish. Holly’s Hill 2010 “Mourvèdre Classique,” El Dorado. 100% Mourvèdre, sourced from several vineyards including the estate vineyard. Medium color, this showed gamey, meaty aromas along with black cherry fruit and hints of herbs and minerals. Medium weight in the mouth, with a juicy feel and good structure, and finishing with moderate tannins, quite nice. Holly’s Hill 2009 Syrah, “Wylie-Fenaughty,” El Dorado. Dark purple color, with smoky dark fruit, black pepper, and a touch of sweet oak on the nose. Medium-full bodied with good stuffing for cellaring. Holly’s Hill 2009 Cabernet-Syrah, El Dorado. Mostly Cabernet. Dark color, showing more vanilla/oak aromas along with currant and plum, spice, and some herbal notes. Richer mouthfeel with chewy tannins on the finish. Holly’s Hill 2009 Late Harvest Roussanne, El Dorado. Medium yellow color, with intense pear and nectarine and a touch of honey on the nose. Rich and medium-sweet, this could have used a bit more acidity but was still pleasant. Holly’s Hill NV Mourvèdre-Syrah Dessert Wine, El Dorado. Medium color, this featured ripe plum and chocolate aromas along with some spice notes. Rich and smooth on the palate, finishing with moderate tannins. 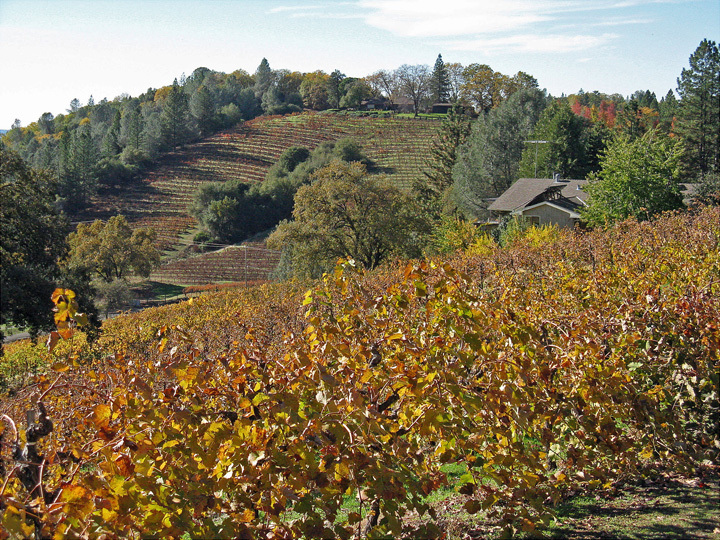 Two hillside estate vineyards at an elevation of over 2,600 feet are at the heart of the Holly’s Hill wines. The first plantings came in 1998, with 15 acres of Syrah vines on quadrilateral trellising, located on steep, terraced slopes with various exposures. In 2006, part of this vineyard was grafted to other varieties, plus some Counoise, Grenache Blanc, Mourvèdre, and Petite Sirah were added. 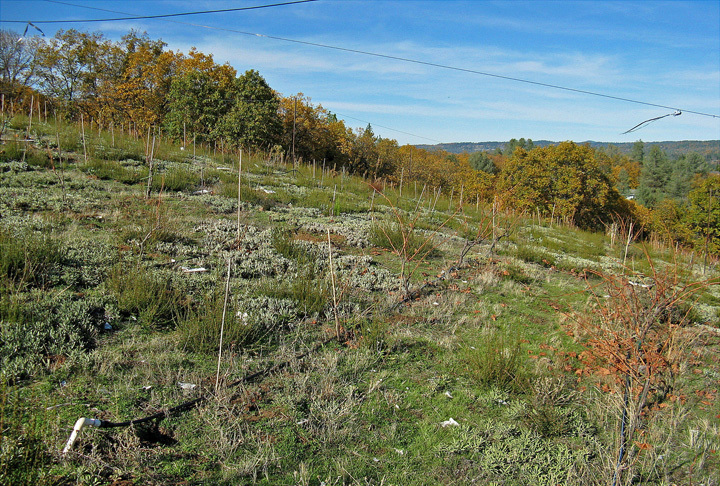 A second vineyard was planted on an adjacent hill in 2000, with Counoise, Grenache, Mourvèdre, Viognier, and Roussanne. The vines for the white grape varieties on this mainly south-facing slope use vertical shoot positioning trellising, while the reds are head-trained. The winery itself was launched in 2001. Carrie and Josh aim for food-friendly wines with good acidity, such as those they love from the Rhône and from Italy. They use older French oak barrels as well as some larger casks to reduce the influence that new oak would have on both flavors and astringent tannins. The neutral barrels help to bring out the varietal and vineyard character of the wines. Most wines are aged on their lees, with barrel aging extending as much as two years for some Syrahs. As he often is, Josh Bendick was behind the tasting bar when we walked into the tasting room, and he was soon joined by Holly Cooper. There are expansive views from there, looking out over the steep slopes of the estate vineyards and far beyond – on a clear day such as when we visited, it’s easy to spot Mount Diablo over 85 miles to the west. Josh and Holly poured us nine of their current releases. The wines aremade from both purchased and estate fruit, and Holly’s Hill produces around 15 different wines in a given year, with various varietal bottlings and blends. Prices range from $20 to $30. In addition to the wines we tasted, there are a handful of others currently available as well as some that were already sold out when we visited. I’ve been a fan of the Holly’s Hill white wines so I was a bit disappointed that both the Viognier and Roussanne were sold out, as was their “Old Vines” Fenaughty Vineyard Syrah, which I’ve liked in the past. The Counoise was also sold out. I’d like to taste theirs sometime, as I think Counoise has a real future in California if planted in the right places and made with a lighter hand, and I suspect that the Holly’s Hill version might fit the bill quite well. But despite missing out on these wines, Josh and Holly still poured plenty of fine wines. I thought the standouts included both the “Patriarche Blanc” and “Patriarche” blends, as well as the “Mourvèdre Classique,” all good wines that should improve with some bottle age. We’d planned a picnic lunch of Thanksgiving leftovers at Holly’s Hill, and we couldn’t have picked a more beautiful day for it. Sitting at the tables next to the tasting room, we enjoyed the sun and the gorgeous views. The wines of Holly’s Hill reminded me that I need to make a more in-depth visit there one of these days. They became one of the top producers in El Dorado County nearly from the start, and they’ve been making consistently good wines for a decade now. Restraint and balance are the keys to the success of Holly’s Hill – not overly ripe, a light touch with oak, the wines are pleasant to drink now and they’re often ageworthy as well. After our lunch at Holly’s Hill we drove south for a few miles and into the Fair Play AVA of El Dorado County, near the town of Somerset. Turning off of Grizzly Flat Road onto an unpaved lane, we soon came to La Clarine Farm. Owner / winemaker Hank Beckmeyer and his wife Caroline Hoel came out to let us through their front gate and greet us. After introducing ourselves, Hank & Caroline wasted little time in leading us up the hill toward their small vineyard. La Clarine 2012 “White Blend,” Sierra Foothills (tank sample). About 75% Semillon, 25% Viognier. Light yellow/straw color, with fragrant citrus and herb aromas. Round mouthfeel but with very nice acidity and a lively finish – while obviously not a finished wine, this is already quite nice. La Clarine 2011 “White Blend,” Sierra Foothills. 37% Semillon, 32% Viognier, 31% Marsanne. A bit lighter color than the 2012, this showed more intense aromas of melon, fig, and nectarine, along with a minerally note. Medium-bodied with a smooth texture along with a bright, crisp finish, very nice. La Clarine 2011 “Piedi Grandi,” Sierra Foothills (tank sample). 55% Nebbiolo, 31% Mourvèdre, 14% Syrah. Medium-light color, with floral undertones along with cherry and plum fruit, earth, and herbs. Medium-light bodied, finishing with moderate tannins. The Nebbiolo showed through but was tempered by the other components. La Clarine 2011 Syrah, Sumu Kaw Vineyard, Sierra Foothills (barrel sample). Dark color, this featured strongly herbal aromas along with smoked meat, dark fruit, and earth. Medium weight on the palate with great structure and grippier tannins on the finish. Very nice “Rhônish” Syrah. La Clarine 2011 “Home Vineyard,” Sierra Foothills (barrel sample). Field blend of mostly Tempranillo, with Syrah, Grenache, Tannat, Cabernet Sauvignon, Negroamaro. Medium-dark color, displaying lots of spice, plus plum and darker fruits, herbs, and minerals. Medium-bodied with a lively mouthfeel, this had a big, tannic finish. La Clarine 2011 Mourvèdre, Cedarville Vineyard, Sierra Foothills. Medium color, with earth and herbs on the nose along with black cherry and plum, minerals, and a hint of flowers. Medium-bodied with very nice texture in the mouth, finishing with medium-big tannins, nice. I asked where the name of the farm came from, and Hank told us that “la clarine” is French for the bells that cattle and goats wear in the alpine pastures, which is appropriate since he and Caroline raise goats on their hilly property. Caroline is originally from Lyon, near the foot of the French Alps – and at a strategic spot for wine, right between Burgundy and the Rhône Valley. Hank also spent time living in Europe, where both he and Caroline had been working in the music industry (a former member of the band Half Japanese, Hank still looks like he could still be in a band today). Looking for a change in their lives, they moved to California in 1999 to pursue other interests. Caroline had already begun serious study of making cheese while Hank wanted to learn winemaking, his early influence coming from the wines of Domaine Tempier among others. They liked the Sierra Foothills and decided to settle there and see if they could create a business that would combine their interests. They purchased a ten-acre property where they now grow grapes, raise goats and chickens, and make wine and cheese, among other things. Caroline used to sell her cheese commercially but now makes it just as a hobby. Early on, Hank learned winemaking working for Bill Easton at his winery in Shenandoah Valley, and he continues to work as assistant winemaker at Sobon Wines in the same area. He started planting the vineyard at La Clarine Farm about eleven years ago, and about two acres are now planted with Tempranillo, Syrah, Grenache, Tannat, Cabernet Sauvignon, and a tiny amount of Negroamaro. A significant reason why Hank and Caroline chose this particular spot for their farm is the combination of decomposed granite soil and many different exposures on the hillside, at about 2,600-foot elevation. Hank told us that the land had been scrub brushland before the vineyard was planted so clearing trees was not needed. While Hank & Caroline share a love of wines from Rhône grape varieties, they wanted to create a field blend of grapes from their small vineyard and planted varieties they thought would grow well there and make an interesting wine together. Originally, the plan had been to farm the vineyard biodynamically, and it was Demeter-certified for a time. Over time, Hank & Caroline realized that this was not the path they wanted to follow for their farming and they converted their farming practices to follow the writings of the late Masanobu Fukuoka, a Japanese rice farmer and author of the book “The One Straw Revolution.” Fukuoka’s writing led Hank to realize that even organic and biodynamic farming is still an effort to control and subdue nature, just using different means than “conventional” farming methods. The idea that he now wants to follow is to do nothing that is not necessary to grow the grapes. For example, many grape-growers regularly spray sulfur on their vines to protect from powdery mildew every year – Hank has said he’s done that only once in four years (though, to be fair, his vineyard is in a dryer location than many in California). Farming is by definition a human intervention, but doing as little as possible is the goal. Hank has noted that this has often been translated (poorly) as “do-nothing” farming, and he’s also said that’s far from the truth – as with any farming, it’s still difficult and time-consuming work. I must state here that I can’t do justice to La Clarine Farm’s grape-growing and winemaking philosophy in these few short paragraphs, so I encourage you to take a look at their website for a far more illuminating look at their ideas behind growing the grapes and making the wine. The appearance of the vineyard at La Clarine Farm is quite different from anything I’ve seen before. For being 10+ years old, the vines are scraggly and thin, they’re spaced widely, and rather than introduced cover crops between the vines, the native plants remain, including aromatic sage and other small brushy shrubs and grasses. This native ground cover is mowed periodically to return nutrients into the soil. No chemicals are used in the farming, and no fertilizers other than the compost produced from the goats and chickens at the property. The goal is a self-contained, sustainable farm – similar to biodynamic practice in that respect, but going further…or perhaps more accurately, going in a different, more “natural” direction. Appropriately, the vineyard gives the appearance of a wild place, one where nature is more in control than man. About the only sign of more “conventional” farming is the presence of drip irrigation lines, which Hank told us are sometimes needed for the vines in the dry growing season, though they try to irrigate just once or twice per year. All vines are head-trained, with Syrah and Grenache on their own roots with most of the other vines grafted to various rootstocks. Hank told us that Tempranillo has had the toughest time in the vineyard. It’s a continuing learning process of what works and does not – varieties, rootstocks, etc. I asked Hank whether he will enlarge the vineyard in the future, but he said he doesn’t currently have any plans to do that – it takes enough of his time to farm what’s already there! Since he does all of the work himself, it would be tough to take on more acreage. As we walked through the vineyard, we could hear occasional gunfire. Just the locals practicing their target shooting we learned, though it was a bit unnerving. We noticed bird netting on the ground waiting to be brought in for the year – Hank told us that birds and raccoons have been the biggest vineyard pests. The bird netting is a pain to put up and take down but it does serve its purpose. From the lower part of the vineyard we looked down the hill and could see some of La Clarine Farm’s 28 goats. Caroline makes goat cheese, and they also provide milk – plus they help clear excess brush and help create compost for the vineyard. We walked back down the hill to a small garage-sized building near Hank & Caroline’s house where Hank makes the wine. The total production was only about 800 cases last year, but Hank said it will increase to about 1,200 cases this year and they hope it will stay around that level. Since they typically are able to only produce a barrel or two of wine from their own vineyard each year, they buy the rest of their fruit from local growers whose farming they admire, including grapes from noted local vineyards Cedarville and Sumu Kaw. Fruit for the La Clarine wines is typically picked on the early side, resulting in lower-alcohol wines than most you’ll find from the Sierra Foothills. Similar to the farming, Hank’s winemaking philosophy is to not do anything that’s not necessary. Native yeast and malolactic fermentations take place for all the wines, and Hank’s goal is to add nothing to the wines during the fermentation and aging, and to rack wines only when needed. Fermentations can sometimes take many months to complete, but they’re allowed to proceed at their own pace. Typically no SO2 is added to the wine until it’s racked just prior to bottling – Hank told us that due to this, it’s essential to top up barrels frequently. He tries to let “problems” with the wines work themselves out in the barrels as much as possible. Having made wine myself, I know it can be difficult to be patient with barrels where the wine has an off aroma, but I’ve certainly experienced times where that aroma goes away on its own and the wine comes back as good or better than before. Hank has admitted that this approach doesn’t always work and on occasion barrels of wine have ultimately gone bad, but it’s a risk he’s been willing to take. All the white wines go through 100% malolactic fermentation to avoid needing sterile filtration to keep the wines stable after bottling. The reds all are fermented with 100% whole clusters, mostly in one-ton fermenters. Hank likes the effect of whole-cluster fermentation on the wines – he feels that it helps dampen the big upfront fruit that Sierra Foothills wines can often have, adding a savory element and creating better overall balance. Looking through my notes on the red wines, I saw that something other than fruit was my first impression on every one of them. The whole-cluster approach also reflects Hank’s philosophy – why destem the fruit when fermentation will take place regardless? The La Clarine wines are all aged in older oak cooperage and plastic flex tanks, to keep oak aromas and flavors out of wine. Hank said that concrete tanks would be nice, but they’re too expensive for them to buy at this point. Hank & Caroline have a small bottling set-up at the winery and they bottle everything on-site. The wines used to feature glass Vino-Lok closures, but they switched to screwcap closures for all the wines a couple of years ago. We tasted through a number of tank and barrel samples with Hank & Caroline, of both 2011 and 2012 wines, along with a couple of bottled wines. Not surprisingly, the two bottled wines we tried – the 2011 White Blend and 2011 Cedarville Vineyard Mourvèdre – seemed the most “finished,” and both were standouts. Hank told us how he waited as long as he could to pick the Cedarville Mourvèdre in the cool 2011 vintage, and it was still under 20 brix! But remarkably, the wine does not seem under-ripe at all and packs plenty of flavor. Some of the upcoming wines already look to be exceptional too, particularly the 2012 White Blend and 2011 Sumu Kaw Vineyard Syrah. Other wines we tasted included the “Piedi Grandi,” a Nebbiolo-based blend (named for a friend’s grape-stomping big feet), and the “Home Vineyard,” the field blend from La Clarine Farm’s estate vineyard. 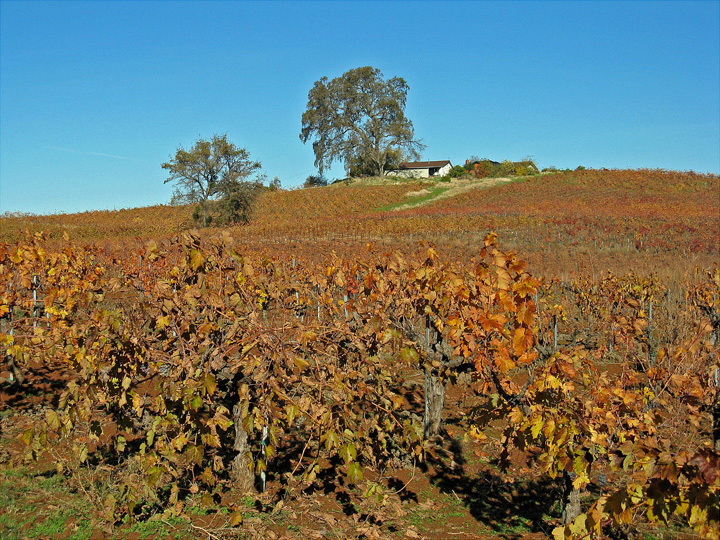 Other recent La Clarine wines include a Syrah-Mourvèdre Rosé and a Sumu Kaw Vineyard Mourvèdre, while earlier efforts included a Grenache Blanc and a skin-fermented Viognier. A new Grenache bottling is in the works, sourced from a vineyard north of Placerville on slate soil. Hank told us that the Grenache will be somewhat higher alcohol than his typical wines – “it’s Grenache,” he explained…understood. Prices of recent La Clarine releases have been from $18 to $30. La Clarine Farm has generated its share of buzz over the past few years because of their low-intervention farming and winemaking methods – a choice that has put them in the company of other wineries making what’s been called natural wine. But as I’ve found with a number of other people making wine that would fall under the natural wine category, Hank is very low-key about it – it seems to be wine writers and critics who are much more “cheerleaders” for natural wine than those who actually make it. I’m sure Hank & Caroline appreciate the sales that all this has generated for their wines, but I got the sense that they’re also somewhat bemused by all the attention. I don’t think they ever intended to be part of any “movement,” natural or otherwise – they are just following their own path. They’re both very thoughtful about and committed to the direction they’ve taken, but they’re not out to convert anyone else to it. I think they’d agree that it would be difficult to replicate what they’re doing (particularly the farming) at a scale of production much larger than what they’re doing. After saying goodbye to Hank and Caroline at La Clarine Farm, we drove south a short way down Mount Aukum Road before turning on Fair Play Road. We admired the beautiful fall colors on the trees along the road, and it wasn’t long before we passed through the small town of Fair Play and arrived at Skinner Vineyards. I’d made a brief stop at the Skinner tasting room the previous year, and the wines were good enough that I wanted to return for a more in-depth visit this time. Although Skinner winemaker Chris Pittenger was not able to be there, his assistant winemaker Eric Wolff hosted us at the winery building. And as a bonus, we were also able to meet there with Greg Baiocchi, who makes his own Baiocchi wines at the Skinner facility. I’d met Greg and tried his wines at a couple of tasting events in the past year and I thought this would be a good opportunity to learn more. Skinner 2010 “Seven Generations,” El Dorado. Blend of Marsanne, Roussanne, Viognier, Grenache Blanc, and Picpoul, to be released in about six months. Light yellow color, featuring ripe stone fruit, spice, and a dash of sweet oak. Medium-rich, with a round mouthfeel and fairly smooth finish. Skinner 2010 Roussanne, El Dorado. Medium-light yellow color, less fruit-forward than the “Seven Generations” with earth, pear, and herb notes. A bit richer on the palate but with a lively finish. Intriguing now, and it should be interesting to see how this ages. Skinner 2010 Grenache, El Dorado. 100% Grenache, from about ⅓ each estate, Fenaughty, and Sumu Kaw vineyards. Medium-light color, this displayed bright strawberry and cherry fruit plus plenty of spice on the nose. Medium-light bodied, this had a fairly smooth texture with milder tannins but with lively acidity on the finish, a nice lighter-weight Grenache. gb 2011 “G minor,” El Dorado. 44% Grenache, 28% Syrah, 28% Tempranillo, sourced from the estate vineyard. Medium color, showing bright and upfront ripe red fruit aromas, along with earth and spice. Medium-bodied with a moderately grippy finish that should smooth out given a little bottle age, nice. Baiocchi 2009 “Entre Nous,” Baiocchi Family Vineyards, Fair Play.90% Grenache, 10% Syrah. Medium-light color, with more earth, herbs, and spice and more muted red fruits on the nose. Medium weight and fairly smooth on the palate, with moderate tannins. Skinner 2010 Mourvèdre, El Dorado.85% Mourvèdre, 15% Syrah, about 75% sourced from estate fruit. Medium color, with slightly floral aromas along with plum and darker berry fruit, earth, game, herbs, and minerals. Medium-bodied with a lively mouthfeel, finishing with medium tannins. Skinner 2010 Mourvèdre, Estate, El Dorado.85% Mourvèdre, 15% Syrah, sourced from both estate vineyards. Medium-dark color, this had brighter fruit along with more pronounced earth and game components than the previous wine, along with similar floral, herb, and mineral notes. More textured and structured in the mouth, this finished with bigger tannins. Tasty and distinctive now, this should age nicely. Baiocchi 2010 “Orellana,” Baiocchi Family Vineyards, Fair Play. 60% Tempranillo co-fermented with 40% Grenache. Medium color, with earth and ripe darker fruit aromas plus touches of spice and vanilla/oak. Medium-full bodied, with grippy tannins on the finish, a nice Tempranillo-based blend. Skinner 2009 “Eighteen Sixty-One,” El Dorado.44% Grenache, 28% Syrah, 28% Mourvèdre. Medium-dark color, featuring intense dark berry fruit, spice, and vanilla/oak. Fairly rich mouthfeel with a big tannic bite on the lingering finish. Skinner 2008 Syrah, Stoney Creek Vineyard, Fair Play. 877 and Noir Syrah clones, co-fermented with about 3% Viognier, aged about three years in barrel. Dark color, aromas of herbs, dark fruit, chocolate, and sweet oak. Medium-rich with a lively mouthfeel and bigger tannins. Baiocchi 2009 “Sprezzatura,” Baiocchi Family Vineyards, Fair Play. 90% Syrah, 10% Grenache. Medium-dark color, with ripe dark berry fruit, spice, earth, and a touch of vanilla/oak. Big and structured, with chewy tannins on the finish. Skinner 2010 Petite Sirah, El Dorado.Not yet released. Very dark color, showing floral notes along with black fruits, spice, and a touch of pepper. Rich on the palate but displaying great acidity and structure, with grippy tannins and a long finish, nice. The Skinner family has a long history in the area. James Skinner – the great-great-great grandfather of current winery owner Mike Skinner – planted vines and started producing wine and brandy in El Dorado County in the 1860s. The original J. Skinner Winery was a victim of Prohibition, but Mike and his wife Carey re-established the family winery in 2007. The winery building was completed in 2010 and the tasting room, atop a knoll with a spectacular 360-degree view, opened in 2011. 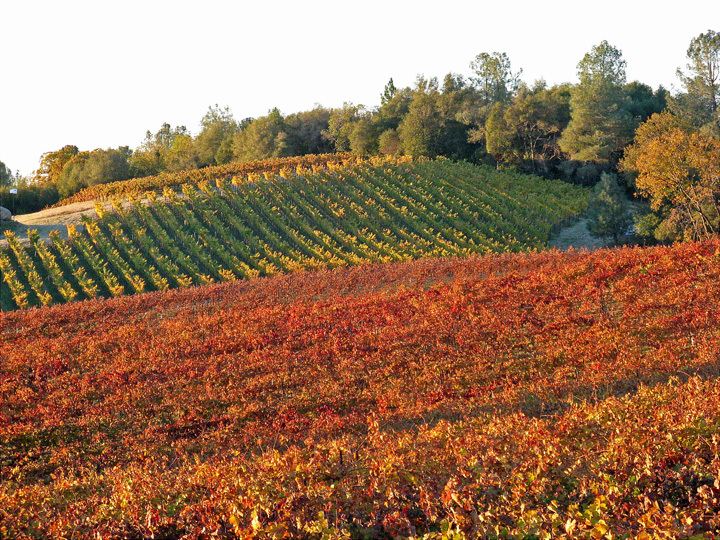 The first wines released were from the 2007 vintage, and like a number of other top El Dorado wineries, Skinner specializes in wines made from Rhône grape varieties. Skinner has two estate vineyards in different locations. Stoney Creek Vineyard is adjacent to the winery and tasting room, on decomposed granite soil at elevations that reach over 2,700 feet. About 20 acres of Viognier, Roussanne, Marsanne, Grenache Blanc, Picpoul Blanc, Syrah, Grenache, Mourvèdre, Counoise, and Petite Sirah are currently grown there. There was already some 877 and Noir clone Syrah and some Viognier at the site planted in 2000 by the previous owner. The Skinners replanted a couple of acres of that with Grenache Blanc in a colder section of the vineyard. 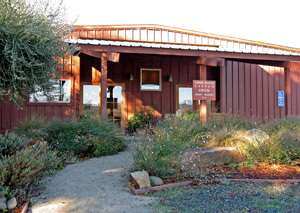 White Oak Flats Vineyard is near the original Skinner vineyard site in Rescue, north of Placerville near Coloma. At about 1,300-foot elevation, there are 13 acres of Viognier, Roussanne, Marsanne, Syrah, Grenache, Mourvèdre, Carignane, and Petite Sirah, Zinfandel, and Mission at White Oak Flats. Currently, Skinner sources about 75-80% of the fruit for its wines from the two estate vineyards. The first 100% Skinner estate wine is the 2010 Estate Mourvèdre, sourced from both estate vineyards. We sampled that wine and I thought it was one of the standouts of the tasting. Winemaker Chris Pittenger earned a degree at Cal Poly San Luis Obispo, and he’s worked at some top-notch wineries in both Napa Valley and Sonoma, as well as in New Zealand and Australia. Chris also has his own label, Gros Ventre Cellars, where he produces some fine Pinot Noir from Russian River Valley, Sonoma Coast, and Anderson Valley. Assistant winemaker Eric Wolff has been at Skinner since 2010, and had worked in the Barossa region of Australia before that. Eric told us that Skinner processed about 65-70 tons of fruit this year. All of the white grapes are whole-cluster pressed. Most reds are destemmed although there is some whole-cluster fermentation, for example on some Grenache and Petite Sirah. 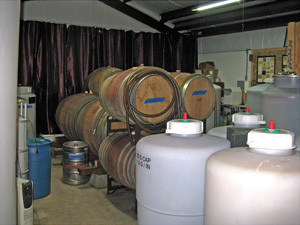 Both native and inoculated fermentations are used in the winemaking process. 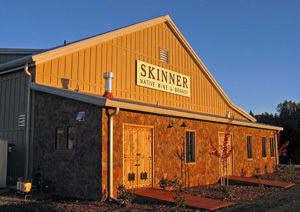 Though most of Skinner’s wines are from Rhône grape varieties, they produced their first Zinfandel in 2010. We also tasted their first Petite Sirah bottling, also from the 2010 vintage and not yet released. In addition to the wines we tasted, Skinner also produces Viognier, Grenache Blanc, a Grenache-Mourvèdre Rosé, and an El Dorado Syrah bottling. Wine prices range from $18 to $34. As mentioned above, Greg Baiocchi was able to meet us at the Skinner facility to pour some of his wines for us. Baiocchi is one of the newest wineries in El Dorado County – Greg and his wife Sharon launched their venture just a few years ago, with their first release coming from the 2009 vintage. From that 150-case start, they’ve now increased production to around 1,000 cases per year. Greg managed to move from one passion in his life – skydiving – to another one in growing grapes and making wine. Greg has mentioned watching his grandfather make wine in his basement, and the thought of doing that himself never left his mind. 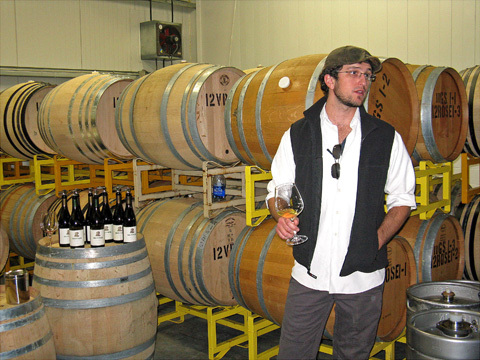 Learning through the UC Davis Extension program, he also gained valuable experience working at Miraflores Winery in El Dorado County and Big Basin Vineyards in the Santa Cruz Mountains, where he worked with Bradley Brown. Greg farms a 12-acre estate vineyard just a few miles from Skinner in the Fair Play area. At about 2,300-2,500-foot elevation, the vines are now in their 7th leaf. Two clones of Syrah, three clones of Grenache, plus Mourvèdre and Tempranillo are currently planted in the granitic soil. Syrah is the first of the varieties to ripen, followed by the Tempranillo, Grenache, and finally the Mourvèdre. Greg & Sharon plan to increase the use of the estate fruit in their wines but will retain other vineyard sources too. Grapes are fermented in smaller bins, and Greg prefers cooler and longer fermentations for the fruit. He told us that he has not done any whole-cluster fermentations but may do some in the future. He does not add any SO2 at crush, and the must typically undergoes a 3-5 day cold soak before fermentation begins, all with native yeast. No additives are used in the fermentation other than some yeast nutrients. Greg likes to press the wines slightly sweet in order to help manage tannins, and they are then aged from 12-30 months in barrel. 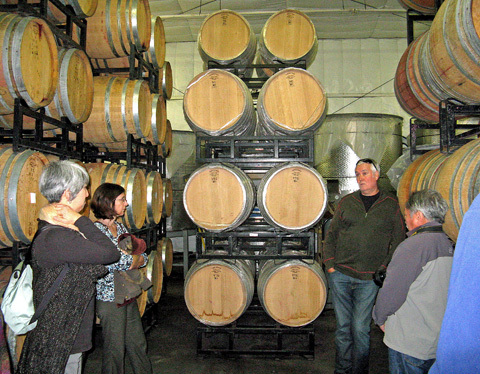 All French oak barrels are used, typically around 25% new, though the “G minor” bottling sees no new oak. Prior to making the Baiocchi wines at the Skinner facility, he first made them at Big Basin and then at Andis Wines in Amador County. Greg & Sharon make their wines under two labels – Baiocchi and gb. The Baiocchi wines come from more select blocks of the vineyard and are barrel-aged longer, with more new oak, and are intended to be more age-worthy. The gb label is more value-oriented, and the wines will have little or no new oak, aiming for a more early-drinking style. Two of the Baiocchi wines we tasted were virtual mirror images of one another – the "Entre Nous" is 90% Grenache and 10% Syrah, while the "Sprezzatura" is 90% Syrah and 10% Grenache. The "Orellana" features co-fermented Tempranillo and Grenache. In addition to the wines we tasted, there is also a gb “Neophyte” Rosé made from Grenache and Mourvèdre – I tried the 2011 vintage of this wine earlier in the year and it was very tasty. There is currently no tasting room for the Baiocchi wines, but Greg told us that he and Sharon are planning to open one in Sutter Creek in 2013, which should expose their wines to a wider audience. Prices are $18 to $24 for the gb wines and $39 for the Baiocchi wines. Eric and Greg had set up their wines on a couple of barrels, and we went through a total of twelve bottles between the different labels. They poured all the wines in a good order to allow us to taste the lighter ones before the bigger wines, rather than go through each label separately. We were able to take advantage of one of the new winery’s four separate climate-controlled interior bays – the tasting was set up in a bay with barrels going through malolactic fermentation, so it was a bit warmer. After our tasting we took a brief tour of the facility. 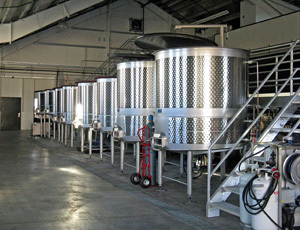 The winery is quite impressive, about 12,000 square feet in size, and built to handle up to a 10,000-case production. The current Skinner production is around 4,000 cases, and since they share the winemaking facility with only Baiocchi and one other producer at this point, there is plenty of open space. Efficient and environmentally-friendly, the building used 80% recycled steel in its construction and the photo-voltaic panel system on the south-facing roof provides most of the facility’s power. Fans can bring in cool night air from the north side of the building, while numerous small windows high in the walls allow in plenty of natural light. There’s a large covered exterior crushpad, while a number of different-sized open top stainless steel fermentation tanks, all with glycol temperature control, sit in the center of the large open interior. Afterwards, we took a walk up along the drive that winds through the vineyard from the winery up to the hilltop tasting room. The panoramic view is among the best you’ll see from any tasting room, and the fall colors of the surrounding trees and vines were intense in the late-afternoon light. Eric took us downstairs to show us the private tasting room, which was designed to evoke the stone cellar of the nineteenth-century J. Skinner winery. The exterior of the new winery building is another nod to the family history – the design is partially based on photos of the original winery, down to the “Skinner Native Wine & Brandy” sign on the front. Favorite wines of the tasting included the Baiocchi “Orellana” as well as the “G minor” from the Baiocchi’s gb label. For the Skinner wines, I thought the Roussanne, Estate Mourvèdre, and Petite Sirah were standouts, with the Grenache not far behind. Skinner and Baiocchi are both among the El Dorado wineries that are pushing Rhône grape varieties to the fore in their area. But other than using largely the same varieties, the wines from the two producer are quite different. The Baiocchi wines are big and ripe, all coming in at 15%+ alcohol. Yet they didn’t strike me as being out of balance or hot – in some ways they’re similar to the bigger Rhône-style wines coming from the Paso Robles area than they are to other Sierra Foothills Rhônes. I thought the influence of Bradley Brown of Big Basin could be felt in the wines too. If the thought of a little Central Coast style in El Dorado sounds intriguing to you, it's a good bet that you'll enjoy the Baiocchi wines. Skinner’s wines are not shy by any means, but neither are they as bold as the Baiocchi wines. The whites are a bit more restrained than the bigger red wines, but there’s good balance in all of them. I found the minerality that I often associate with El Dorado wines (is it from the granitic soil?) came through in several of the Skinner bottlings. They’re all very skillfully made, and I expect that the Skinner wines will become even better as the vines in their estate vineyards mature in the coming years. Our final stop of the day came late in the afternoon, when we drove to Cedarville Vineyard, just a few miles from Skinner. A visit to Cedarville has been the one constant throughout the years of my Sierra Foothills wine journeys. I met the husband and wife owner / winemaker team of Jonathan Lachs and Susan Marks back in 2000 at the first Hospice du Rhône event I attended in Paso Robles, and visiting with them has always been a pleasure. But more than that, I’ve recognized that they have consistently made some of the best wines coming from the Sierra Foothills and have done much to raise the bar for wine quality in the area, particularly in El Dorado County. Cedarville 2011 Viognier, El Dorado. 100% Viognier. Light straw color, with lightly floral scents plus bright nectarine and citrus aromas and a touch of spice. Moderately rich texture along with good acidity and a long finish, nice. Cedarville 2010 Grenache, El Dorado. Includes 16% Syrah, 8% of which was co-fermented with the Grenache. Light garnet color, this featured ripe strawberry and black cherry fruit, herbs, and hints of minerals. Lighter-bodied with fairly mild tannins. Cedarville 2010 Zinfandel, El Dorado. Blended with about 4% Petite Sirah. Medium color, this combined bright Zin berry fruit with some darker notes, along with spice and a touch of vanilla/oak. Medium weight with a lively mouthfeel, this finished with moderate tannins. Cedarville 2010 Syrah, El Dorado. Includes 4% co-fermented Viognier. Medium-dark color, displaying a floral component along with plum and darker fruit, minerals, herbs, and a dash of chocolate. Medium-rich with good balancing acidity and refined tannins, nice. Cedarville 2007 Cabernet Sauvignon, El Dorado. 100% Cabernet. Medium-dark purple, with herbs, currant, minerals, spice, and chocolate aromas. Fairly big and structured but the grippy tannins have started to soften. Cedarville 2010 Petite Sirah, El Dorado. Medium-dark color, this showed dark berry fruit, black pepper, mocha, and a touch of sweet oak. Medium-full bodied, the tannins are big but not aggressive, a fairly tame Petite Sirah. Although I’ve written about Cedarville before, I’ll provide a brief summary about them here. 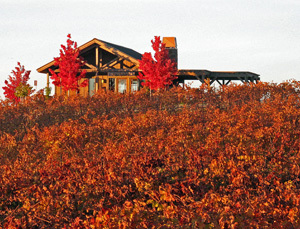 Cedarville is another El Dorado winery specializing in wines made from Rhône grape varieties, along with Zinfandel and Cabernet. Jonathan and Susan met while studying enology at UC Davis, and they purchased and planted their property in the Fair Play area in 1995. 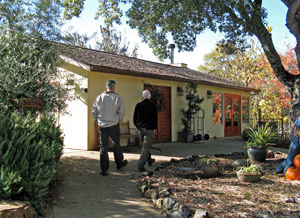 Their first wines were from the 1998 vintage, and after several years of commuting from their day-jobs in Silicon Valley, they made the move into their house overlooking the vineyard in 1999. They completed their winery, partially sunken into a hillside, the following year. Their 15-acre vineyard, on decomposed granite soil at an elevation of about 2,500 feet, is planted to Viognier, Grenache, Mourvèdre, Syrah, Zinfandel, and Cabernet Sauvignon. Farmed using sustainable growing methods from the beginning and dry-farmed when possible, Jonathan & Susan made a transition to organic farming in 2010. That has included bringing in a herd of goats to eat the yearly growth of brush along a seasonal creek on the property. All of Cedarville’s wines are made from estate-grown fruit except for the Petite Sirah, grown at nearby Naylor Vineyard. They also sell some of their fruit – as we’ve seen, they sell Mourvèdre to La Clarine Farm. We met Jonathan & Susan at their house atop a knoll at the high point of their vineyard, and tasted their wines on the back porch as we enjoyed a beautiful sunset. As at Holly’s Hill, the vista extends far beyond the local hills, and the mountains of California’s Coast Range were clearly visible, looking much closer than they really were. Susan pointed out distant Mount St. Helena on the horizon, dominating much of the landscape in Napa and Sonoma over 100 miles away. As we tasted the wines, we spotted a cat that was nearby but was keeping its distance – Jonathan & Susan told us that it’s a local feral cat that has sort of adopted them and does a fine job of helping to keep down the population of vineyard pests. The wines have been consistent over the years, reflecting a sense of place in the minerality that is a common feature in many of the bottlings. I am often surprised when looking through my notes on their latest wines at how closely the descriptions match those of previous vintages. Their Viognier, Grenache, and Syrah have tended to be my favorites over the years and the current releases of those varieties continue their strong showing. The Zinfandel is brighter and features better acidity than many you’ll find from the Sierra Foothills while the Cabernet is often a hidden gem with a minerally edge. This year Cedarville has added a new wine to their line-up – a limited bottling called “Turnabout's Fair Play.” A Grenache-based blend that also includes Syrah and Cabernet, this is inspired by the wines of Priorat in Catalonia. Prices for most of the Cedarville wines range from $20 to $29, with the “Turnabout's Fair Play” being higher. Jonathan & Susan chose the Cedarville name to honor a nearby town of that name founded by Sierra Foothills pioneers in 1852. The town is long-gone but the winery named for it continues to be among the leaders in the region. It’s been fascinating to see how the Cedarville wines have changed from vintage to vintage – not really in the winemaking, which has remained much the same through the years, but in the fruit coming from an increasingly mature estate vineyard. The most recent Cedarville wines build on the tradition and success of the earlier ones, and I expect to see that trend continue. After leaving Cedarville, we drove south into Amador County and continued a few miles past the Shenandoah Valley wine region where we would return the next day, finally arriving at our destination of Sutter Creek, where we were all staying for the night. I realized that it had been quite a few years since I’d been there – since my last visit, Highway 49 has been realigned and no longer passes right through the Gold Rush-era towns of Amador City and Sutter Creek. Fortunately it was no problem to find our way into town (even without a GPS in my case!) and we had a pleasant overnight stay. Our first stop on Saturday morning was at Terre Rouge / Easton, in the Shenandoah Valley growing region of Amador County. We arrived a few minutes before our scheduled appointment and spent the time looking around at the vines adjacent to the tasting room. Owner / winemaker Bill Easton arrived shortly afterwards to greet us. 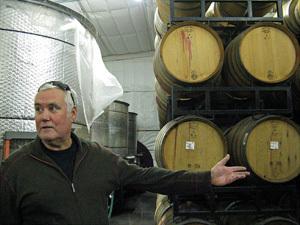 Bill has been around the Amador wine scene for many years, founding his winery there in 1994. Prior to that, he owned and ran the well-known Solano Cellars wine shop in Berkeley for many years. Bill’s wife Jane is a noted cook (and cookbook author), and created a menu for the Solano Cellars wine bar – the first wine bar in the East Bay. Terre Rouge 2009 Viognier, Fiddletown. Fruit sourced from the estate vineyard. Light straw color, with bright and minerally pear and citrus aromas along with a touch of spice. Medium weight and smooth on the palate but with a crisp finish, nice. Terre Rouge 2012 Viognier, Fiddletown (tank sample). Fruit sourced from the estate vineyard. Cloudy light yellow color, displaying stone fruit and banana at this point, though this was still going through malolactic fermentation (it had completed primary fermentation). Pleasant mouthfeel with good acidity on the finish. Terre Rouge 2011 Syrah, Sueno Vineyard, Clements Hills (barrel sample). This will go into the “Les Côtes de l'Ouest” blend. Medium-dark purple color, this showed some reduction at first but it opened up with some air to reveal bright aromas of plum, blueberry, earth, and herbs. Medium-bodied with a fairly smooth texture and milder tannins. Terre Rouge 2011 Syrah, Sentinel Oak Vineyard, Pyramid Block, Shenandoah Valley (barrel sample).Darker color, featuring a darker fruit profile with spice and mineral notes and slightly floral undertones. Medium-bodied, the acidity kept the mouthfeel lively while the tannins were significant but refined. A very nice young Syrah. 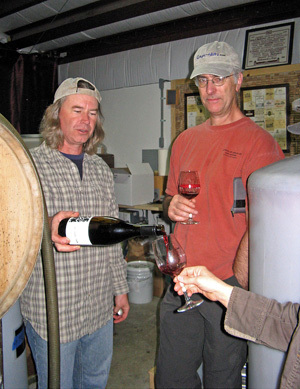 Terre Rouge 2011 Syrah, DTR Ranch, Fiddletown (barrel sample). Dark color, this wine also had a noticeable floral component, along with black fruits, smoked meat, and an herbal note. Slightly bigger on the palate than the Sentinel Oak, showing fine structure and medium-big tannins, very nice and quite distinctive. Terre Rouge 2011 Grenache, Duarte-Georgetown Vineyard, Sierra Foothills (barrel sample).50% whole-cluster fermentation. Medium garnet color, showing a savory component along with red fruits and a slightly saline note. Medium-light bodied and not as tannic on the finish as I would have expected, an interesting and promising young Grenache. Easton 2011 Zinfandel, “Old Vine,” Fiddletown (barrel sample).Sourced from Rinaldi Vineyard. Medium-dark color, with intense bright raspberry fruit along with some spice and earth notes. Round mouthfeel with good acidity and a moderately chewy tannic finish. Needs some time to settle down but this should be very good. Easton 2011 Zinfandel, Estate, Shenandoah Valley (barrel sample). Medium-dark color, displaying ripe and intense boysenberry, spice, and a touch of oak. Bigger and more structured on the palate, this finished with rougher tannins that should mellow out in time. Easton 2011 Cabernet Sauvignon, Estate, Shenandoah Valley (barrel sample).100% Cabernet Sauvignon. Dark color, herbal aromas plus bright currant and black cherry fruit, plus baking spice notes. Full-bodied and built to age, but not overly tannic. 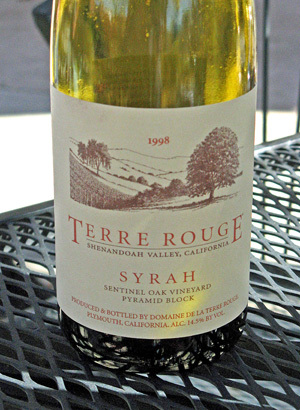 Terre Rouge 1998 Syrah, Sentinel Oak Vineyard, Pyramid Block, Sierra Foothills. Medium-dark color, savory aromas along with plum and red fruits, with hints of game, brine, and spice. Still surprisingly structured in the mouth with moderate tannins on the finish. Terre Rouge 2009 Syrah, “Ascent,” Sierra Foothills. Dark color, slightly floral aromas along with dark fruits, herbs, and a dash of vanilla/oak. Medium-full weight on the palate with substantial but not harsh tannins. Overall a more elegant style than the single-vineyard Syrahs and quite nice. Terre Rouge 2008 Syrah, “Ascent,” Sierra Foothills. Dark color, showing riper fruit aromas with more plum and red fruit profile plus a bigger herbal component. Bigger mouthfeel than the 2009 with a more grippy tannic finish. Terre Rouge 2001 Syrah, “Ascent,” Sierra Foothills. Medium-dark color, this featured plum and black cherry fruit, game, and a savory component. Showing some bottle-aged character but still youthful – this should age nicely for many more years. Terre Rouge 2009 Grenache Blanc, Sierra Foothills. Very light color, with apple and herb on the nose. Medium-light bodied with a round mouthfeel, but a lively and crisp finish. Easton 2005 Barbera, Shenandoah Valley.Medium ruby color, somewhat shy aromas of cherry plus lots of spice and herbal undertones. Medium-bodied with bright acidity on the palate and on the finish. Terre Rouge 2009 “Tête-à-Tête,” Sierra Foothills. 42% Syrah, 38% Mourvèdre, 20% Grenache. Medium color, an herbal component led the way along with earth and red fruits. Good structure and a lively finish, a value wine that shows complexity and balance. 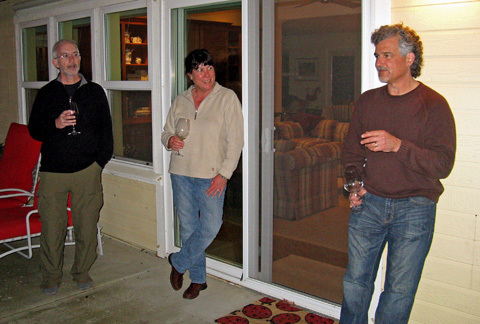 Bill & Jane’s winery produces wine for three separate labels. The first label is Terre Rouge – meaning “red earth” in French, this is a reference to the reddish granitic and volcanic soil common to the area, the color due to iron oxide and cinnabar. Terre Rouge focuses entirely on wines made from Rhône grape varieties. Wines released under the Easton label are made from other varieties, mostly Sauvignon Blanc, Zinfandel, Barbera, and Cabernet Sauvignon. There is also the Easton House label for more value-priced wine. Between all the labels, more than 20 different bottlings are produced each year. Bill sources his fruit from vineyards in four Sierra Foothills counties – Placer, El Dorado, Calaveras, as well as Amador – plus some fruit from the Clements Hills appellation just west of the Foothills. Bill told us that there were only about a dozen wineries in Amador County when he started Terre Rouge and Easton – there are about 40 now – but that Amador wine history goes back to Gold Rush times. Bill buys old-vine Zinfandel from the Rinaldi Vineyard (formerly Eschen Vineyard) in the Fiddletown area, which dates back to 1865. Bill’s interest in wine goes back to his parents, who drank wine regularly, and his father was in a local wine club. 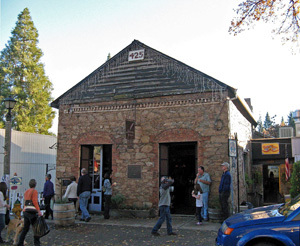 He said that they would sometimes drink D'Agostini jug wines from Amador County – one of the oldest wineries in California, the original facility dates back to the 1850s and is now part of Sobon Winery. While he was running Solano Cellars, Bill looked to carry wines from small and lesser-known vintners, and he also became more interested in European wines, particularly French and Italian. When the time came to search for property to start his own winery, his goal was to produce more structured “Euro-style” wines, and so he looked for a spot with what he called a “synergy” of grape variety, soil, and climate. Amador County fit the bill for him with its Mediterranean climate and its volcanic and granitic soils, and he told us it reminded him of parts of Europe that he’d visited and admired. He felt the area had great potential but had been largely underutilized by serious winemakers in the past. Bill feels that the soil and climate of the Sierra Foothills lends more acidity and minerality to wines than is the case in many other California growing areas. In addition to the winery and surrounding vineyards that Bill farms in Shenandoah Valley, he & Jane also own a 24-acre site in the Fiddletown area, where they grow Viognier and Syrah. As Bill led us the few steps from the tasting room to the winery itself, we couldn’t help but see a large tanker truck trailer conspicuously sitting outside. Bill told us there was Zinfandel in the insulated tanker – due to the larger-than-expected crop in 2012 (the winery brought in about 60 tons more than anticipated), there was not enough space in the other tanks for everything. He said he was due to get in 100 additional used barrels soon, which would free up more tank space. Bill said that 2012 produced good fruit set, even ripening, and very little mildew pressure throughout the vineyards from which he sources fruit. As we walked into the winery, Bill mentioned the photo-voltaic panel system on the roof. Providing about 90% of the winery’s power at present, he said that it may be upgraded in the future since the utility company will now buy back excess electricity, which it did not do when the system was installed. Other environmentally-friendly practices include sustainable and organic farming, return of grape pomace to the vineyards, use of compost made from green waste collected in Amador, Sacramento, and Bay Area green waste containers, and at least 25% recycled glass used in bottles. Bill started out our tasting with a bottle of 2009 Viognier from his estate vineyard in Fiddletown, before moving on to a tank sample of the same Viognier from the new 2012 vintage. He mentioned that this year’s Viognier was fermented entirely in stainless steel due to shortage of available barrels with the large crop – he usually likes a little tight-grain new oak to add some spice to the wine. Typically, the Viognier starts fermentation in tank, then is racked to barrels at about 10-12 brix to finish fermentation there. I’d spotted a few macrobins outside the winery with “Bokisch” markings on them, which I recognized as being from vineyards farmed by Markus Bokisch in the Lodi area, and I asked Bill about them. He said he buys some Syrah from Markus, and in fact he’s purchased fruit from same ten-acre block of Sueno Vineyard in the Clements Hills area east of Lodi (Bill likened the Clements Hills to Languedoc) since 1998. As we tasted a barrel sample of that wine, Bill told us that the vineyard has lighter, sandy granitic soil, and the fruit forms the basis for the Terre Rouge “Les Côtes de l'Ouest” blend. The Sueno Vineyard fruit usually makes up about 50% of that blend along with fruit from Amador County, and the wine is meant to be in a softer style that will fit into by-the-glass restaurant programs. To aid in that, “Les Côtes de l'Ouest” gets some bottle age before release – the 2009 vintage is the current one. And although Bill is a strong promoter of the Sierra Foothills wine region, he also wants to show that a “California” appellation – such as that for his “Les Côtes de l'Ouest” – does not necessarily denote an inferior wine. We went on from there to taste 2011 barrel samples of two single-vineyard Syrahs, both of them among Terre Rouge’s signature bottlings. First was the Syrah from the Pyramid Block of Sentinel Oak Vineyard. Planted in 1983-84 with own-rooted Syrah 1 and Estrella River clones, the vineyard is not far from winery on a south-facing slope with granitic soil at about 1,400-foot elevation. Next was Syrah from the estate DTR Ranch in Fiddletown. Planted in 1999, DTR Ranch includes about 7 acres of Syrah and ½ acre of Viognier. Much of the Syrah there is own-rooted Syrah 1, 877, and Noir clones. On volcanic, schist, and slate soil, it has a cooler climate than at Sentinel Oak, and Bill said that the Syrah at DTR Ranch is usually harvested about four weeks later. All of the estate Syrah as well as that at Sentinel Oak Vineyard is cane-pruned, and Bill noted that the own-rooted vines are more vigorous and tend to require more attention during the growing season. He told us that he prefers more mature vineyard sites, since he feels it takes 8-10 years for a Syrah vineyard to come around and really display its character. I should note that Bill picked older barrels for us to taste from rather than new ones – we were in agreement that tasting from new oak is often not very illuminating in sensing the character of a developing wine in barrel. Moving along from the Syrahs, we next tasted a barrel sample of Grenache – Bill said it would go into the Terre Rouge “L’Autre” blend (formerly called “Noir”). The component percentages vary year to year but typically it’s in the range of 75% Grenache and 12.5% each Syrah and Mourvèdre. Bill said that he’s planning to rack and blend wines in February. We asked about whole-cluster fermentation, and Bill told us that his use of that varies, but that both Grenache and Syrah can be up to 50%, while Cabernet Franc for the Easton label is 100% whole-cluster. 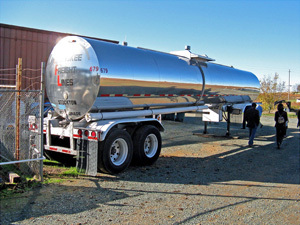 Fermentations generally take place in insulated stainless steel tanks. We talked a little about sorting fruit prior to fermentation, and Bill believes that fruit can be over-sorted – he prefers some variety rather than strict uniformity. Next up was a Zinfandel barrel sample from the old Rinaldi Vineyard, on decomposed granite soil just outside of Fiddletown. The fruit was picked at lower brix than usual in 2011, and Bill noted that half of his wines from that vintage will be under 14% alcohol – that’s unusual for wines from warm Amador County but perhaps not so surprising coming from the cool 2011 growing season. We followed this with estate Zinfandel, the fruit coming from the vineyard right across the road from the winery, and planted in 1972. Bill mentioned that he blends a little Petite Sirah in the Amador County Zin bottling, but the vineyard-designate Easton Zinfandel bottlings are 100% varietal. The final barrel sample was Cabernet Sauvignon from the same estate vineyard as the Zinfandel. The Cab will be 100% varietal, and Bill mentioned that his model for the wine is Château Léoville-Las-Cases from Saint-Julien. Nearly all of the barrels in the winery are French oak, and Bill told us his favorite barrel is three-year air-dried François Frères from the Allier forest. After we’d finished tasting through the barrel samples, we sat down at tables on the patio area between the winery and tasting room, while Bill brought out a special treat for us. The day before our visit had been the annual release party for the Terre Rouge “Ascent” Syrah, their top-of-the-line bottling, and there were a few open bottles left from the event. We were able to taste the current 2008 release, the 2009 bottling that will be released next year, and a 2001 wine. “Ascent” is a blend from different vineyard sites and can vary from year to year. Bill told us that he aims for more complex aromatics for the “Ascent” Syrahs. The wine is aged in 100% new oak for two years and then spends another two years in bottle prior to release. The “Ascent” Syrah, being a blend from different vineyards, sacrifices some of the distinct vineyard character we noted in the single-vineyard barrel samples, but it gains greater elegance in return. In addition to the three “Ascent” Syrahs, Bill also brought out a 1998 Sentinel Oak Pyramid Block Syrah for us to taste – not surprisingly, the wine is aging very nicely and still has plenty of life in it. Since we were sitting out at the tables enjoying the beautiful weather, we decided to bring out a picnic lunch – we had plenty left from the previous day’s lunch to last us another day. Before leaving, we popped into the tasting room to try a few current releases before heading to our next stop. I limited myself to three wines – a crisp Grenache Blanc, bright Barbera, and earthy and herbal “Tête-à-Tête” blend. Favorite wines at Terre Rouge / Easton included the 2011 barrel samples of both the Sentinel Oak Pyramid Block Syrah and DTR Ranch Syrah, as well as the 2011 Rinaldi-Eschen Zinfandel. For the current releases, both the 2009 Viognier and Grenache Blanc were very nice, as was the “Tête-à-Tête” blend. 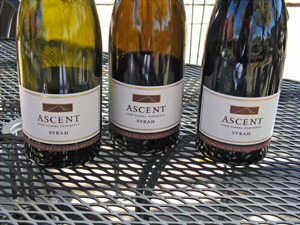 And our preview of the upcoming 2009 “Ascent” Syrah showed that it will be another winner. Prices of most Terre Rouge and Easton wines are in the $16 to $38 range, with the Easton House wines being a bit less and the “Ascent” Syrah being higher. Bill Easton has been making some of the best wines from the Sierra Foothills for many years, and it was clear from this visit that that’s still the case. I thought the two single-vineyard Syrah barrel samples in particular were stunning displays of the different terroirs in the area. The distinctiveness of these two wines showed how Bill’s long experience with all of the vineyards he works with has helped him gain an understanding of the area and its grapes that few other winemakers have. Both the Terre Rouge and Easton wines have proven to be ageworthy, displaying the structure that was a major part of Bill’s reason for making wine from the Sierra Foothills. As we left Terre Rouge / Easton, we decided to make one more stop in Amador County before continuing south to Calaveras wine country. Eric Anderson had visited the area earlier in the year and mentioned that Wilderotter Vineyard was one of the places he felt was worth checking out, so we all got into the cars and drove the couple of miles to their tasting room. At least we thought we’d all gotten into the cars for the short drive – we quickly figured out that we’d somehow left Alan back at Terre Rouge! He occupied himself playing with the winery cat while Dean headed back to retrieve him. Wilderotter 2010 Grenache Rosé, Estate, Amador County. 93% Grenache, 7% Syrah. Light pink color, with bright strawberry and herb aromas. Pleasant and fairly smooth mouthfeel and finish. Wilderotter 2011 Roussanne, Sierra Foothills. Light greenish straw color, this had a slight reductive note which blew off to show stone fruit, citrus, and spice on the nose. Medium-rich texture with a lively finish. Wilderotter 2010 Viognier, Estate, Amador County. Light color, displaying ripe stone fruit and floral aromas along with a touch of spice. Rich and full-bodied, with a smooth finish. Wilderotter 2009 Mourvèdre, Estate, Amador County. Medium-light garnet color, with minerally bright black cherry and plum and earth. Fairly light on the palate with a lively mouthfeel and finish, nice. Wilderotter 2009 Grenache, Estate, Amador County. Medium-light color, showing a vanilla/oak component along with red fruits and baking spice. Medium-light bodied with a lingering spicy finish. Wilderotter 2009 “Ambrosia,” Sierra Foothills. 50% Grenache, 50% Tempranillo. Medium color, this featured plum and red berry fruit, minerals, spice, and smoky undertones. Bigger and more structured, this had grippy tannins on the finish. Wilderotter 2009 Zinfandel, Estate, Amador County. Medium color, ripe raspberry and boysenberry, earth, and a dash of sweet oak. Medium-bodied with a moderately tannic finish. Wilderotter 2009 Tempranillo, Estate, Amador County. Medium-dark color, with plummy and smoky components upfront, along with black cherry, dried herbs, and a touch of pepper. More full-bodied with good acidity and chewy, youthful tannins, a promising wine that should improve with a few years in the cellar. Wilderotter 2010 Barbera, Estate, Shenandoah Valley. Medium color, showing fresh cherry and raspberry fruit, pepper, and herbs. Medium-bodied with lively acidity and moderate tannins, another young wine that deserves a bit of bottle age. Wilderotter 2009 Petite Sirah, Estate, Amador County. Dark purple color, this displayed black fruits, chocolate, and spice on the nose. Fairly round mouthfeel and moderately rich, it finished with grippy tannins. Once we were all back together we walked into the Wilderotter tasting room, inside a handsome tile-roofed adobe-style building adjacent to the estate vineyard. Jay Wilderotter and his wife Maggie purchased their 40-acre property off of Shenandoah School Road in 1986, and after some UC Davis viticulture and enology courses, Jay made the initial planting at the site in 1990 – Viognier, Zinfandel, Syrah, and Barbera. There are currently about 26 acres planted, with Sauvignon Blanc, Roussanne, Grenache, Mourvèdre, Tempranillo, and Petite Sirah joining the first four grape varieties there. In 2001, Jay & Maggie began to make the transition from strictly growing and selling grapes to also making their own wines, starting with three barrels each of Zinfandel and Syrah. They followed that by building their own winery and the tasting room in 2004. All of the Wilderotter wines come from their own estate fruit with the exception of a Russian River Valley Chardonnay and a Napa Valley Cabernet Sauvignon. Jay continues to head up the winemaking himself and annual production is up to about 3,000 cases. 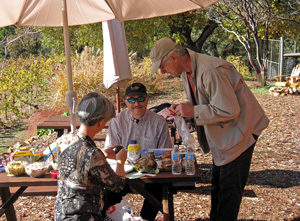 While a few of us sampled the wines inside the tasting room, others relaxed on the shaded patio facing the vineyard. Rachel was our friendly pourer at the tasting bar. I decided to skip the Chardonnay and Cabernet since I wanted to focus on their estate wines. Despite passing on those two, there were still ten wines to taste there! In addition to those wines, Wilderotter produces an estate Sauvignon Blanc. Overall, I preferred the red wines to the whites we tasted, with the Mourvèdre, Tempranillo, and Barbera being my favorites. Most prices ranged from about $16 to $28, with the Cabernet being a bit more. 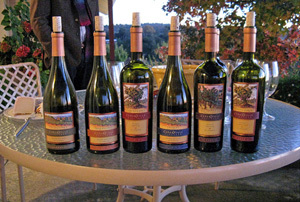 The Wilderotter bottlings were good examples of Amador County wine. Though most of them were the type of big, ripe wines that Amador is known for, I didn’t find any of the over-ripe character that sometimes mars other wines from the area. Although these may not have been the most exciting wines out there, there were several tasty ones – and well-priced, too – and Wilderotter looks to be a worthwhile stop for future Amador visits. If we’d had a bit more time, it would have been nice to visit another Amador County winery – Cooper, Dillian, Sobon, and Vino Noceto were on my list of possibilities – but we needed to hit the road again. Jane and Warren headed back to the Bay Area as we left Wilderotter, while the rest of the group drove south for about an hour until we reached the town of Murphys in Calaveras County. Most of our drive was along scenic Highway 49, which runs through the historic Sierra Foothills gold country. When we reached Angels Camp – site of Mark Twain’s “Celebrated Jumping Frog of Calaveras County” story – we turned east along Highway 4, which ultimately crosses the Sierra Nevada mountains at Ebbetts Pass. But we turned off the highway after about ten miles and onto the quaint main street of Murphys. I’d been to Calaveras County wine country before, but it had probably been at least ten or twelve years since my most recent visit. When I’d been to Murphys before, it was a fairly quiet town with two or three wine tasting rooms along the main street. Lavender Ridge 2010 Roussanne, Sierra Foothills. Very light straw color, with pear and nectarine scents and a touch of spice. Medium rich mouthfeel with a smooth finish. Lavender Ridge 2011 “Côtes du Calaveras Blanc,” Sierra Foothills. Blend of Marsanne, Roussanne, Viognier, and Grenache Blanc. Very light color, this had ripe stone fruit, lees, and spice aromas. Fairly full-bodied with moderate acidity and smooth finish. Lavender Ridge 2010 Grenache, Sierra Foothills. Medium-light color, showing spicy and herbal cherry fruit on the nose. Medium weight with good acidity and milder tannins. Lavender Ridge 2009 “Côtes du Calaveras,” Sierra Foothills. About 40% Mourvèdre, 20% Grenache, 7% Alicante Bouschet, plus Syrah and Petite Sirah. Medium-light color, this displayed lots of spice plus black cherry, earth, and a hint of pepper. Medium-bodied with a lively mouthfeel and moderate tannins, nice. Lavender Ridge 2009 Syrah, Sierra Foothills. 97.5% Syrah with 2.5% co-fermented Viognier. Medium-dark color, featuring plum and darker berry fruit, herbs, and a touch of oak. Richer on the palate with medium-big tannins on the finish. Though I’d heard things had changed since then, I still was not prepared for what I found this time. The street was bustling with visitors, and there are now 24 tasting rooms along the few blocks through the center of town. 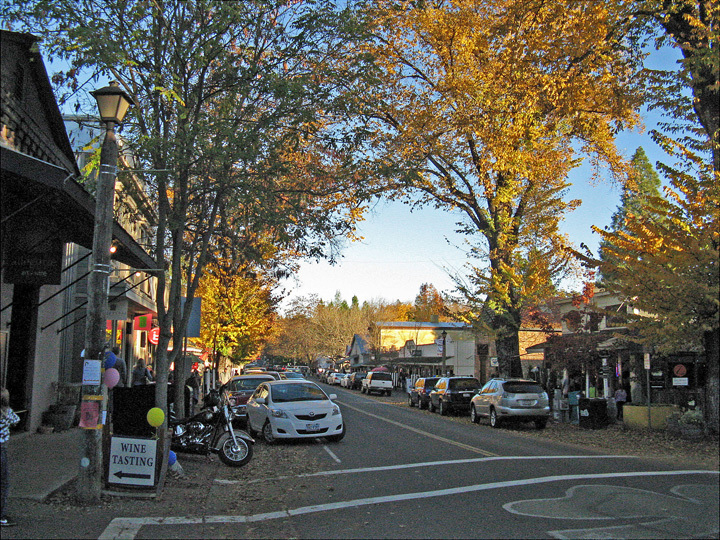 One of the oldest towns in the Sierra Foothills, Murphys was founded by brothers Jon and Daniel Murphy in 1848. Murphys Hotel, built in 1856, is one of the oldest continuously-operating hotels in California – the guest register there features signatures of Mark Twain, Ulysses S. Grant, J.P. Morgan, and Charles Bowles (better-known as the outlaw Black Bart) among others. After finding places to park along the busy street, we made our first tasting room stop in Murphys at Lavender Ridge, another Eric Anderson recommendation. The building – like several others along the main street – occupies a historic building, this one the solid-looking stone Segale Building, built in 1859. The beginnings of Lavender Ridge go back to only 2001, though, when winemaker Rich Gilpin and his wife Siri bought property in the Copperopolis area west of Angels Camp. At about 1,200-foot elevation, the 42 acres of vineyards are planted to Rhône grape varieties – Viognier, Roussanne, Grenache, Mourvèdre, and Syrah. In addition to the grapes, the Gilpins grow olives and – you guessed it – lavender. 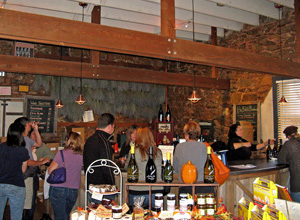 The small tasting room features many lavender products on display. Eric Anderson had mentioned that the lavender scent could be a distraction from the wine aromas, but on my visit I didn’t find that to be a problem. Rich Gilpin has a long history in the wine business. After earning a degree in enology at UC Davis, he has made wine for over 25 years, first in Sonoma and Napa, and then in the Sierra Foothills, where he was the winemaker for a number of producers including Cooper and Windwalker. In addition to Lavender Ridge, Rich continues to make wine for other clients – currently at Broll Mountain Vineyards and Krames Family Wines. Siri grows the lavender on the property, which she and Rich felt had similar climatic and soil conditions to parts of the Rhône Valley, leading them to plant their Rhône grape varieties there. The vineyard is farmed organically, and the wines are fermented with native yeast and are bottled unfiltered whenever possible. The winery features a large underground space to allow for natural cooling. The Gilpins have a sister winery called Coppermine, which focuses on Bordeaux grape varieties – it’s located just a few miles from Murphys in Vallecito, but we didn’t have time to visit there on this trip. We were greeted by Julia in the tasting room, and she poured us five wines. Some of the wines were paired with tasty artisan cheeses that are also sold there. All of the wines are sourced from Sierra Foothills fruit, with much of the fruit coming from the estate vineyard. The “Côtes du Calaveras” red blend was my overall favorite of the wines we tasted, while the Roussanne was my favorite of the two whites. I had hoped to try Lavender Ridge’s Rolle (also known as Vermentino), but it was not available to taste that day. Other wines that we didn’t taste include a Viognier, Mourvèdre, Alicante Bouschet, Petite Sirah, and a Vin Doux Viognier dessert wine. Prices were from about $18 to $34. I thought that Lavender Ridge poured some nice wines – nothing all that exceptional but well-made and tasty. But in any case, a number of the wines they produce that we didn’t taste there sound intriguing enough that I’d definitely like to make a return visit and give them a try. From Lavender Ridge it was just a short stroll down the street to the tasting room of Twisted Oak Winery. Their tasting room in Murphys is one of two – Twisted Oak’s other tasting room is at their winery, a few miles away in Vallecito. I wanted to taste here since I’ve tried a number of the wines over the past few years at the TAPAS (Tempranillo Advocates, Producers, and Amigos Society) tasting event in San Francisco. Twisted Oak specializes in both Rhône-style wines and those made from Spanish and Portuguese grape varieties. Twisted Oak 2011 Verdelho, Calaveras County. Very light color, with pear and stone fruit aromas along with an herbal note. Medium-bodied and fairly smooth in the mouth and on the finish. Twisted Oak 2010 “*%#&@!,” Calaveras County. 63% Mourvèdre, 25% Syrah, 12% Grenache. Medium color, this showed bright plummy fruit, herbs, earth, and a touch of sweet oak. Good acidity with moderate tannins on the finish. Twisted Oak 2009 “Torcido,” Calaveras County. 100% Garnacha. Medium-light color, displaying more vanilla/oak on the nose along with red fruits and spice. Medium-rich mouthfeel with some tannic bite on the finish. Twisted Oak 2009 “River of Skulls,” Calaveras County. 100% Monastrell. Medium-light color, less fruit-forward than the “Torcido” with earth and herbs coming to the front and darker berry fruit and oak in support. Medium-bodied with nice acidity and moderate tannins. Twisted Oak 2009 Tempranillo, Calaveras County. 100% Tempranillo. Medium color, this featured earth, leather, tobacco, plum, and mineral aromas, without the overt oak influence found in a number of the other wines. Fairly big and structured, with a grippy tannic finish, a distinctive wine with the potential to age well. Twisted Oak 2009 “The Spaniard,” Calaveras County. 68% Tempranillo, 17% Garnacha, 15% Graciano. Medium-dark color, the vanilla/oak component jumped out ahead of the dark berry fruit and earth notes. More full-bodied and quite tannic on the finish. Twisted Oak 2008 Syrah, Tanner Vineyard, Calaveras County. 100% Syrah. Medium-dark color, with smoky plum and boysenberry fruit plus spice and oak undertones. Medium-bodied with moderate acidity and a smooth mouthfeel, this finished with fairly chewy tannins. Twisted Oak was founded by Jeff Stai and his wife Mary in 2001, and the winery has been among the leaders in California wines made from Iberian grape varieties over the years. The 10-acre estate vineyard in Vallecito is at nearly 2,300-foot elevation, and was first planted to Tempranillo, Garnacha (Grenache), and Graciano. The Twisted Oak name refers to a large California Blue Oak tree on the winery property. There is now a second estate vineyard outside of Murphys as well. 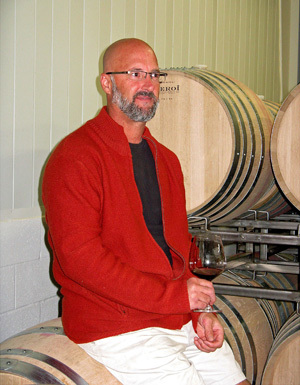 Scott Klann was the original winemaker, while Mark Kunz – previously at nearby Chatom Vineyards – took over the winemaking duties in the summer of 2012. 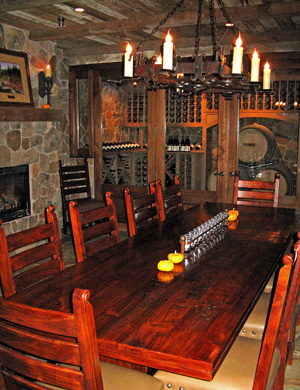 The first wines were produced from the 2002 vintage, and were made at various locations until the Twisted Oak winery was completed in 2004. The facility combines time-honored winery design ideas such as a wine cave and a multi-level layout to enable gravity-flow, with state-of-the-art features like pneumatic punchdown devices for the open-top stainless steel fermenters. Current production is in the neighborhood of 12,000-14,000 cases per year. About 20-25% of the fruit for the Twisted Oak wines comes from the estate vineyard, while the rest is purchased from other local sources. In earlier vintages, some fruit came from outside the local area (such as Verdelho from Silvaspoons Vineyard in Lodi) but I found that all of the fruit for the current wines is now sourced from within Calaveras County. When checking the wine list while tasting, I also noticed that more of the wines are now 100% varietal in composition than they had been in the past. Besides the wines I tasted, Twisted Oak also produces a Viognier, a white Rhône-style blend, other Tempranillo and Syrah bottlings, and a “kitchen sink blend” of Tempranillo, Monastrell (Mourvèdre), Graciano, Carignane, and Garnacha. There’s also a Petite Sirah that I didn’t taste, though Eric tried it and liked it quite a bit. Prices range from $18 to $35 with the exception of the top-of-the-line “The Spaniard” bottling. 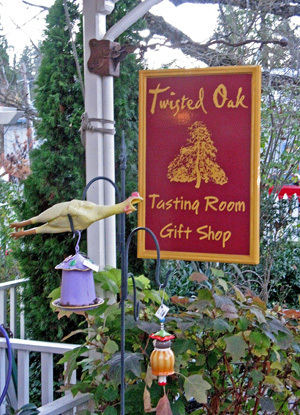 Twisted Oak shows that they don’t take themselves too seriously, from wine names like “*%#&@!” (Potty-Mouth), “Cockamamie” Syrah, and “Ol’ Chumbucket” to the liberal display of rubber chickens throughout the tasting room. 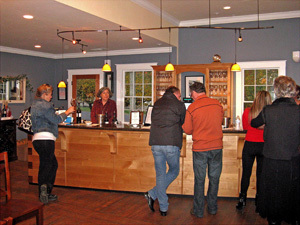 A spirit of fun pervaded the tasting room, where the atmosphere was more lively and informal than at many other places. And in general, the wines are certainly not shy either. But though the packaging may display humor, the wines themselves are serious and solidly-made, though not all of them hit the mark stylistically for me, with some displaying more overt oak character than I’d prefer. The wines where I felt the oak influence was dialed back, such as the “River of Skulls” and the Tempranillo, were my favorites of the bunch. And both the Tempranillo and the “*%#&@!” are especially fine values as well. Twisted Oak sets itself apart with its light-hearted attitude, and though the wines were a bit hit-and-miss for me, there’s still plenty to like here. We said goodbye to Tom, Nancy, and Janine before they started on their drive home following our visit to Twisted Oak. The rest of us made our final wine-tasting stop of the day directly across the street, at the tasting room of Hovey Winery. Like Twisted Oak, I had been introduced to Hovey through the TAPAS tastings in San Francisco. Their 2007 “Rolleri Cuvée” Tempranillo had been one of my favorites of that event a few years ago, and the 2009 vintage was not far off the pace last year. The tasting room building is another historic one – it had once been the 1850s childhood home of noted physicist Albert Michelson. The first American to win a Nobel Prize in the sciences, he is known for his work to measure the speed of light in the late nineteenth and early twentieth centuries. Hovey 2011 Viognier, Rolleri Vineyard, Calaveras County. Light straw color, showing aromas of ripe stone fruit, citrus rind, and a slight leesy note. Medium-rich on the palate with a long, smooth finish. Hovey 2011 Chardonnay, “Duende,” Calaveras County. Medium-light straw color, this displayed stone fruit and tropical fruit notes along with spice and lees. A lighter style with a good texture and crisp finish, nice. Hovey 2010 Tempranillo, “Rolleri Cuvée,” Calaveras County. Medium-light color, with red fruit and plum, earth, and dried herbs on the nose, plus a savory note. Medium-light bodied with lively acidity and moderate tannins, nice. Hovey 2010 Barbera, “Walker Cuvée,” El Dorado. Medium-light color, bright cherry, spice, and touches of pepper and oak. Bright acidity in the mouth, with milder tannins. Hovey 2010 Zinfandel, Dragone Ranch, Calaveras County. 85% Zinfandel and 15% co-fermented Petite Sirah. Medium color, featuring peppery dark berry fruit and hints of chocolate. Big and structured, with a fairly grippy tannic finish. 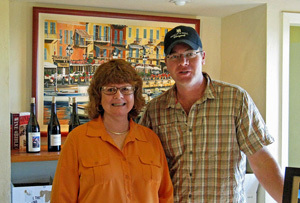 It was near the end of the afternoon when we made it to Hovey, where Judy and Gail welcomed us up to the tasting bar. Chuck Hovey is another winemaker with a long local history. Following a stint as cellarmaster at J. Lohr Vineyards from 1977-1983, he joined Stevenot Winery just outside of Murphys in 1983. He became their director of winemaking in 1988 and he remains there today. He also makes wine for Gianelli Vineyards in Jamestown, south of Murphys near Sonora. 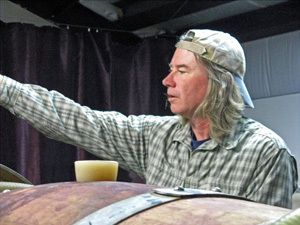 Chuck and his wife Jan launched the Hovey label in 2007 and their first wine, a Chardonnay, was released the following year. 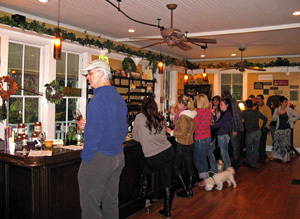 The tasting room opened in May 2012. Production has built up slowly and is expected to reach about 2,500 cases in the near future. We tasted all of the Hovey current releases – in addition to these, they’ve also produced a Petite Sirah. The Viognier is pressed to tank and then racked to older French oak barrels for fermentation. The lees was stirred in the barrels for three months after fermentation was complete. Chardonnay grapes are picked at night and receive similar treatment to the Viognier. Of note is that the 2011 Chardonnay is only 12.5% alcohol, something of a surprise coming from warm Calaveras County. Tempranillo goes into small open-top fermenters and is aged in French and American oak for 18 months, and the Barbera also ages for 18 months in barrel before bottling. The Zinfandel is co-fermented with 15% Petite Sirah from a block specifically planted to go with the Zin. Chuck Hovey’s stated winemaking goal is to use a light hand in the process, and I thought that showed in the wines. Prices are very reasonable, from $20 to $24. Hovey will be introducing a new white blend and new red blend into their lineup in spring 2013. Named in honor of Albert Michelson, they'll be called "C²" (the speed of light squared). They'll also release a new vintage of Petite Sirah early in the year, as well as a Cinsault from Rolleri Vineyard. Hovey’s signature wine remains the Tempranillo from Rolleri Vineyard, located above Angels Camp. Chuck has made Tempranillo from this vineyard for over a dozen years. The belief is that the hot days during the growing season, combined with cooler nights due to the elevation and the low humidity typical of the area are all conducive to growing Tempranillo in Calaveras County. Thus far it looks like a promising variety for this wine region, and Chuck has had as much or more experience with it than anyone. Not surprisingly, the Tempranillo was one of my favorites of the Hovey wines, along with the Chardonnay. 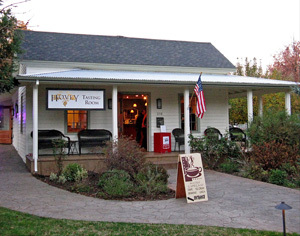 Overall, Hovey presented a very good group of wines – the most consistent line-up I tasted among the three tasting rooms we visited in Murphys. The quality of the winemaking was apparent in producing wines from grapes associated with areas as diverse as the Rhône Valley, Burgundy, Spain, Italy, and California and making them all so well. With all the years of experience that Chuck Hovey has in making wine from the Sierra Foothills, it should be interesting to see how his own winery develops in the years to come – it certainly seems to be off to a good start. Once the sun had disappeared over the horizon so did the warmth of the day, and it was noticeably more chilly by the time we walked out of the Hovey tasting room. As was the case in Amador County, we ran short of time to get to a couple of other Calaveras tasting rooms I would have liked to visit, particularly Tanner and Stevenot. Those will need to wait for another trip to the area. We had an easy drive back to the Bay Area along Highway 4, with a stop along the way in Stockton for dinner. I was glad to spend the extra day in the Sierra Foothills on this trip. It was far less rushed than the usual up-and-back one day journey I’ve made in the past. And perhaps the extra time gave me a renewed sense of promise from this diverse wine region. It’s often overlooked in favor of the more coastal grape-growing areas, and for a variety of reasons, it’s true that it has lagged behind in wine quality for a number of years compared with those coastal regions. But quality is undeniably on the upswing, and I believe that it’s a very good sign to see growers taking on the challenge of different, non-traditional grape varieties in their areas. Longtime Sierra Foothills quality leaders such as Terre Rouge / Easton, Cedarville, and Holly’s Hill are now being joined by more and more wineries who are raising the bar for the region’s wines. 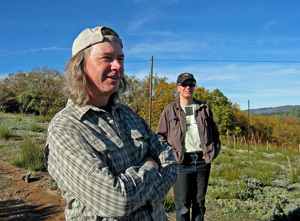 Some, such as Skinner and Baiocchi, are widening the role of Rhône-style wines in the Sierra Foothills, particularly in El Dorado. I think that Rhônes may be on the path to supplanting Zinfandel as the signature wines of the area. Other producers, such as Twisted Oak and Hovey, are starting to fulfill the promise of Iberian-variety wines in the Foothills – these particularly seem to be finding a home in Calaveras County. And I was reminded that the area – in this case Amador County leads the way – has also done well with Italian grape varieties, especially Barbera. Add to all this the highly distinctive and intriguing wines being made by La Clarine Farm, and it points to a wine region that could be on the cusp of creating some real excitement in the near future. And with the fine values that wines from the Sierra Foothills represent compared with those from most of California, it’s excitement that we can afford. Bill Easton spoke of a synergy of grape variety, soil, and climate in the Sierra Foothills. It may have been confined to a relative few places in the past, but it looks more and more like that synergy is starting to spread. As always, thanks to everyone that we visited for being so generous with their time and their wine!